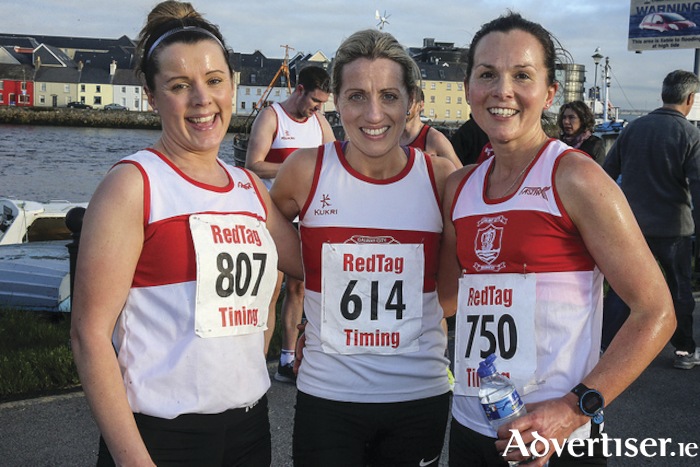 Resolution Run 5k top three women: L to R , Kathryn Casserly (third), Regina Casey (winner) and Jane Ann Meehan (second), all of GCH. Photo: John O Connor. Mooney was one of some 350 runners, joggers and walkers to take part in the Runireland.com sponsored Resolution Run, held on a glorious New Year’s morning in Galway. The flat and fast route started on Grattan Road, took participants towards the city onto Merchants Road, Dock Road, than back on a loop out to the Prom and back, finishing at the Claddagh Hall. Mooney was chased hard by Patrick Chesser of Ennis Track, who ran 16:09, while in third place was Galway City Harriers athlete David Carter, in a time of 16:16. In the women’s race it was the talented Regina Casey from Galway City Harriers who took top spot on the podium in a fast time of 17:21, with Jane Ann Meehan, 20 seconds behind in 17:41. Also on the podium was Kathryn Casserly in a time of 18:24, to make it three GCH ladies in the top spots. Shauna Bocquet of Craughwell AC also put in a fine performance finishing at 16.01 to be first wheelchair athlete, as did clubmate William Fitzgerald, who was first junior male home in the race in a superb time of 16:17. The Galway Indoor Track and Field Championships for 2019 take place over two days in Athlone IT Arena this weekend. The National Indoor League takes place on January 12 and 26 - the first day in the National Indoor arena in Abbottstown, Dublin on Saturday next. GCH and Craughwell AC will aim to field teams in this first national competition of the season. Training sessions resume across all of Galway athletics clubs next week. Of interest to beginners are the Fit for Life programmes which help people get started or return to fitness. Galway City Harriers sessions resumed Monday (January 7 ) at Westside Library, and continue every Monday and Thursday at 7pm, with beginner groups on February 4. Tuam AC commenced on Tuesday (January 8 ) at 7pm. Loughrea AC adult speed/interval training started in Bushfield yesterday, Craughwell Fit for Life commences January 14 at the senior track at 7.30pm, and Athenry AC’s Fit for Life is starting back on Monday January 21 2019 at 6:30pm at Joyce’s Car Park.